The residential sector had a particularly positive February with £1.7 billion contracts awarded, an increase of 13.1% on January. 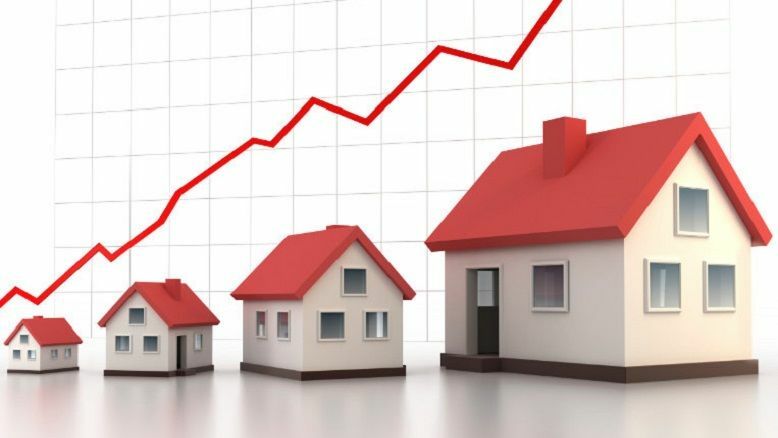 Residential unit numbers also increased – up by 5.4% on January at 9,850 units. 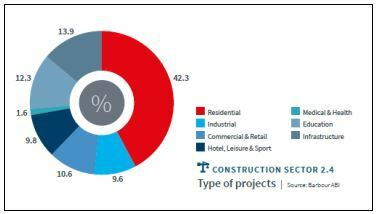 Following residential in terms of contracts awarded was infrastructure with a 13.9% share and education with a 12.3% share. The latest edition of the Economic & Construction Market Review from industry analysts Barbour ABI highlights levels of construction contract values awarded across Great Britain. This month it shows the total value of construction contracts awarded in February 2019 was £5.4 billion which is a 0.5% decrease on January, but 10.6% higher than February 2018. 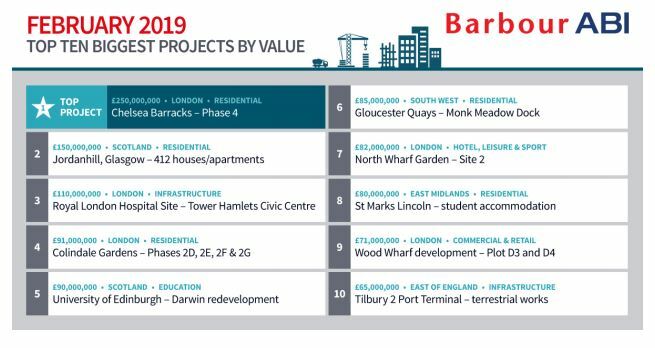 The top project awarded during February was the £250 million redevelopment of Chelsea Barracks which sees Multiplex Construction Europe provide a total of 88 residential units in a single 5 storey structure. The largest infrastructure contract was the £110 million redevelopment of the former Royal London Hospital site in Tower Hamlets to provide a new civic centre and council offices. The largest overall education contract was in Edinburgh and was the £90 million redevelopment and extension of the Darwin Building for the University of Edinburgh.